THERE were celebrations for Lisburn student Jennifer Rainey recently after the ACCA (Association of Chartered Certified Accountants) announced that Jennifer has achieved joint first in Ireland and tenth in the World for the International Reporting paper of the ACCA Qualification in the December 2008 exam sitting. The achievement was recognised at the recent ACCA Ulster Lunch, where Keith McManus, President, ACCA Ulster Branch stated that the performance of accounting students within Northern Ireland, such as Jennifer, augers well for long term business generation here. 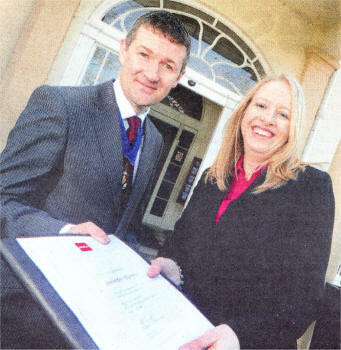 Commenting on the Award Jennifer, said: "I am delighted that my achievement has been recognised by ACCA. It has been hard work but very rewarding and I would like to commend the ACCA for the support that it gives to students working to achieve professional status." Keith McManus said: "It is to Jennifer's credit that she has done so well in these exams. The papers within the ACCA Qualification are very challenging and to have performed so well in such a competitive environment is exceptional. We are certain that this will give Jennifer an excellent foundation to build her future career. "I would call on employers here to support the training of our young people, from whatever sector, by providing them with the resources to develop and harness their skills and keep them in Northern Ireland to ensure future economic prosperity."